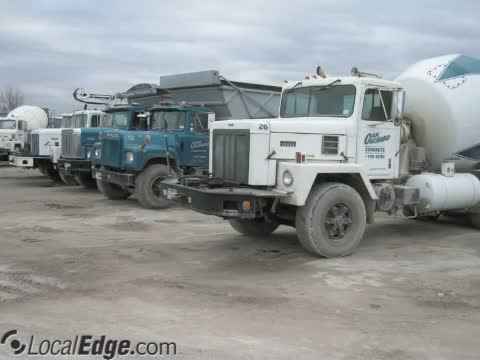 Oak Orchard Concrete, Quality Ready Mix Concrete. Serving Homeowners, Contractors, Farms Large & Small. Serving Orleans & Eastern Niagara & Genesee Counties. Radio Dispatched - Delivery Weekday & Saturdays. 40 foot conveyor trucks, front discharge mixers. We offer Prompt service with quality products and friendly faces. Ready mix concrete, stone & dump truck service, concrete supplies, stone slinger, color concrete. Established 1949. A family-owned business, Oak Orchard Concrete is ready to help you with your next job, no matter how big or small. Customer satisfaction is our number one priority along with completing the job at hand to our fullest potential. Oak Orchard Concrete only provides the highest quality concrete and supplies. We strive to exceed our customer’s expectations in every aspect of the process. We offer a variety of products and mix designs for any concrete application. Whether you are a large general contractor, subcontractor, home builder, or do-it-yourself home owner, we have solutions to all your concrete needs. Oak Orchard Concrete is committed to delivering customers premier decorative concrete products, our customers come first and our success is attributed to complete customer satisfaction. Because the material serves as the foundation for all our artistry, its quality and suitability for the job are paramount. Which is why Oak Orchard Concrete makes sure this is top priority. We stay current with the latest industry means and methods.We want to be your source for not only the highest quality and cost effective products, but your resource for new techniques and problem-solving services. Oak Orchard Concrete offers a variety of products and services including: Concrete Supplies, Stone Slinger & Dump Truck Service. Quality ready mix concrete, ready mix delivery, radio dispatched ready mix concrete, commercial concrete, conveyor trucks, concrete driveways, color concrete. We look forward to hearing from you, please call us at (585) 798-4890. Ready Mix Concrete, Concrete Supplies, Stone Slinger & Dump Truck Service. Quality concrete, concrete delivery, ready mix delivery, radio dispatched concrete, commercial concrete, conveyor trucks, concrete driveways, color concrete.